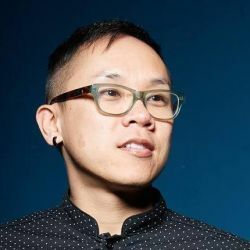 “Born in San Jose, California, Phillip Hua was raised in the city that would eventually become the heart of Silicon Valley. As a child, he spent his days wandering the many fields and creeks now replaced with redevelopment, fueled by the tech industry. He eventually received his BFA from the Academy of Art University in San Francisco. Everything ages. Everything degrades with the passage of time, and where others see only degradation, Phillip Hua sees endless possibilities and finds the place for his art. Rather than working with pigments that will last for hundreds of years, the artist seeks the meaning of decay and ephemerality. His artwork addresses growing environmental concern through non-traditional painting. Hua is a visual artist who relies on technology and digital processes in order to project what is on his mind. He uses newspapers, construction paper, tape and other everyday materials, but it’s the exposure to the light and the passage of time that ultimately shape the artworks and deliver the final message. His work questions what we value in nature and what we sacrifice for those values."